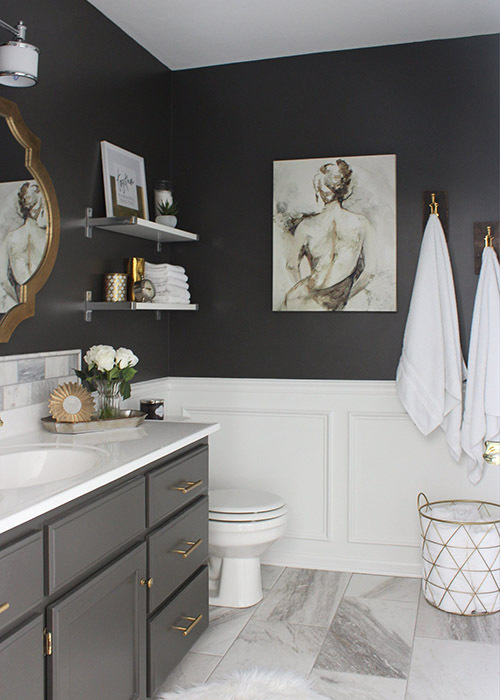 > Blog Get Your Bathroom Organized with Marie Kondo! 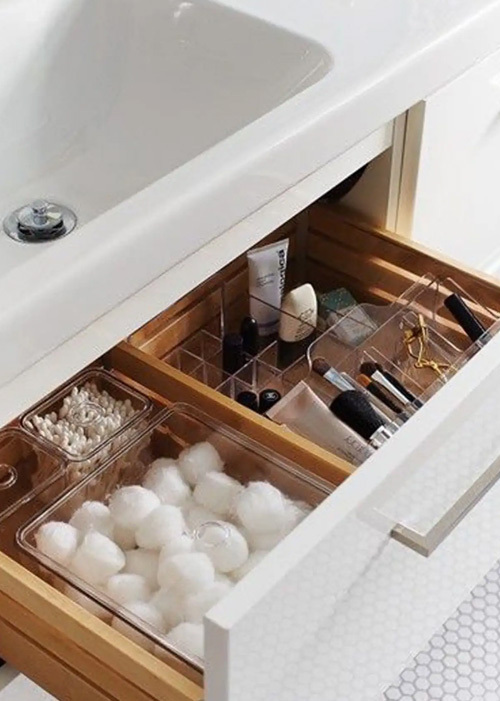 Get Your Bathroom Organized with Marie Kondo! Roll up your sleeves and check off these quick decluttering tips from the well-known KonMari Method. Dubbed the “Queen of Organization,” Marie Kondo's famous mantra “spark-joy” quickly gained popularity throughout the world. Kondo teaches life-changing tips and tricks on how to tidy up closets, desks, and drawers for healthier and happier homes everywhere. 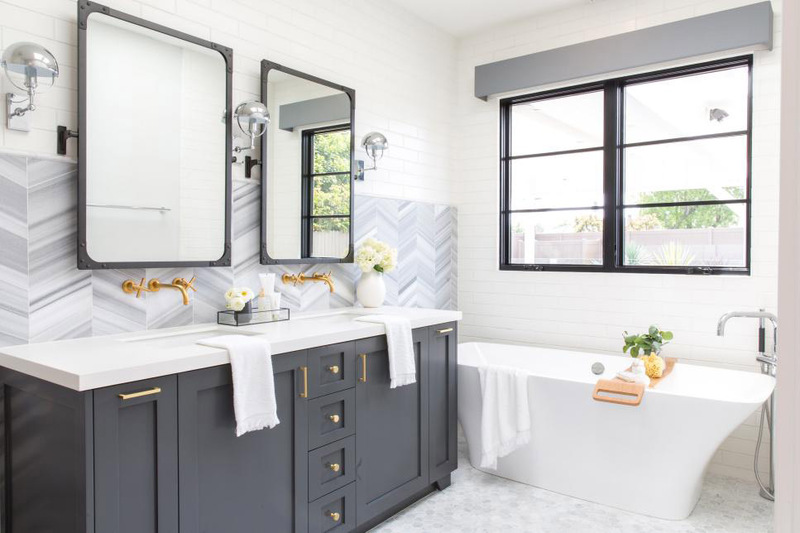 Here’s how to put her method to work in your bathroom for a clean and refreshing private oasis. 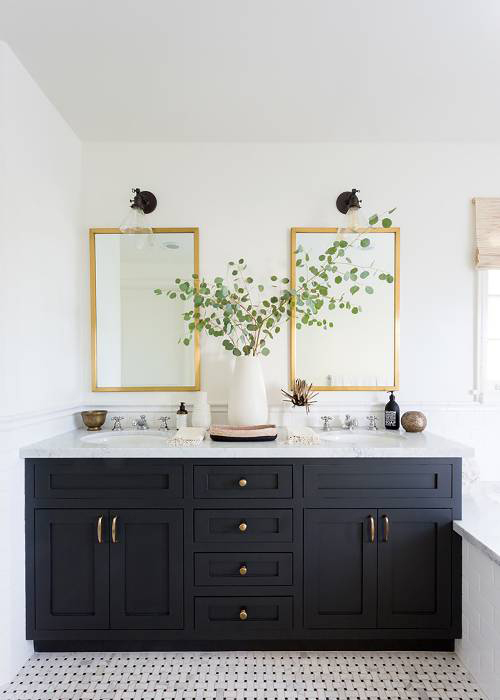 A central rule from Marie Kondo’s signature method is to “Keep only those things that bring you joy,” or which “spark-joy.” You don't have to get rid of all your bathroom decorations; keep those that make you happy and add to your sense of peace. Save important items you love like plants, framed photos and small decor pieces, which can act as accent pieces. 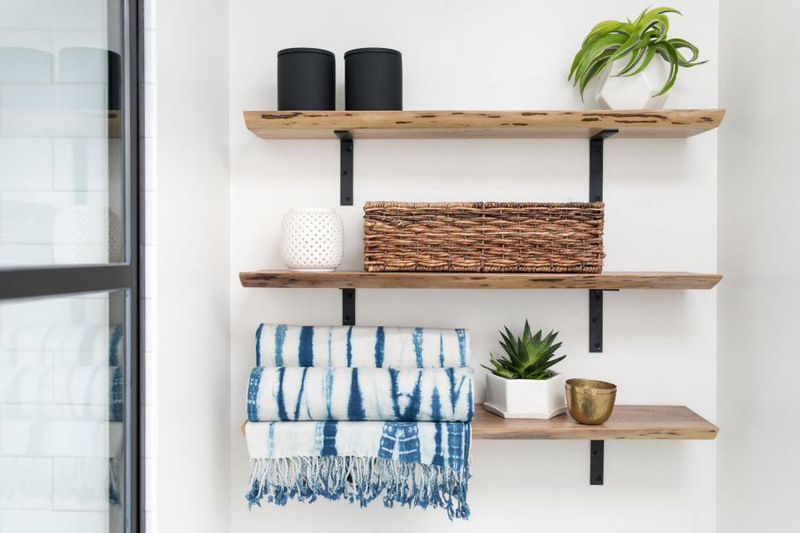 Display your favorite items on open shelves or your vanity. Just remember to keep them organized and away from clutter. A great tip to help bring the room together is by arranging the decor pieces in a thoughtful way. Kondo focuses on small details and tosses out anything that may not belong in a space or which, doesn't “spark-joy”. 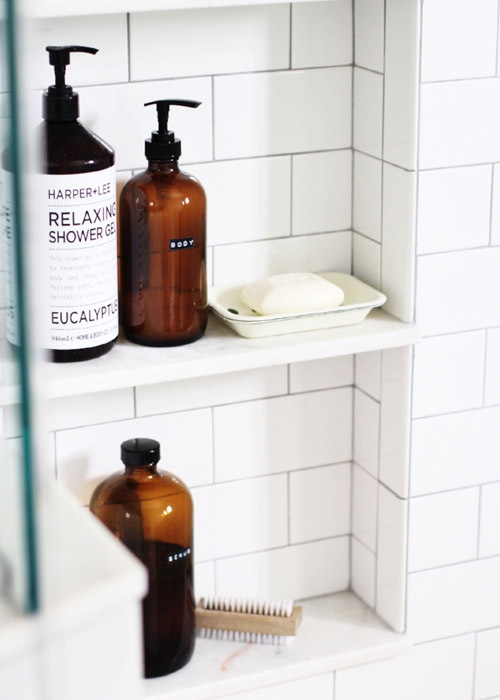 For bathrooms with large medicine cabinets, take the time to sort and re-organize your products. The key is cleanliness. After putting yourself together, remember to immediately place the items back where they belong. If your bathroom has open shelvings, you should definitely follow Kondo's methods. Clutter is movement visible when out in the open and can contribute to a busy and stressful ambiance. Opt for labeled storage bins or containers that are easy to access. 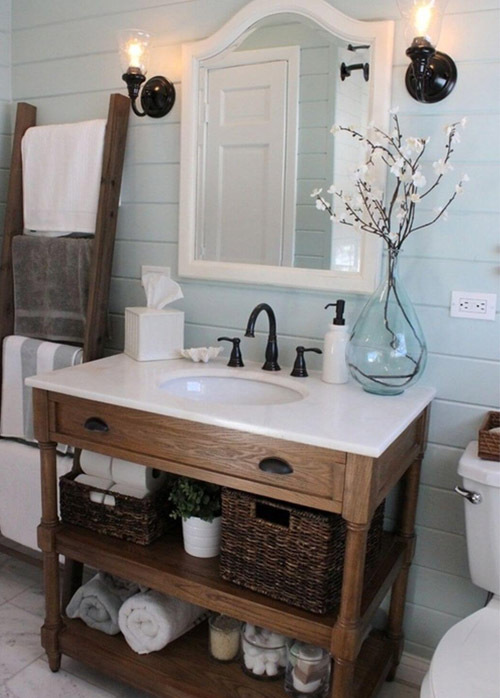 Either place them above the vanity or underneath the sink for a clear and clean space. 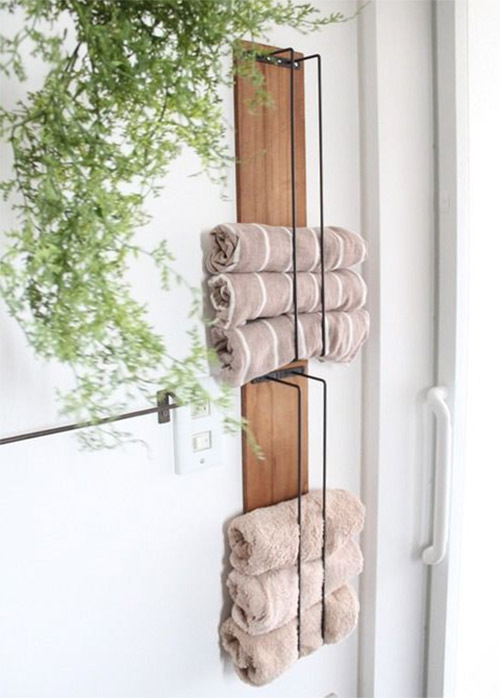 Let's face it, the towel rack isn’t large enough to hang the entire family’s towels. Try DIY-ing your own farmhouse style towel rack. 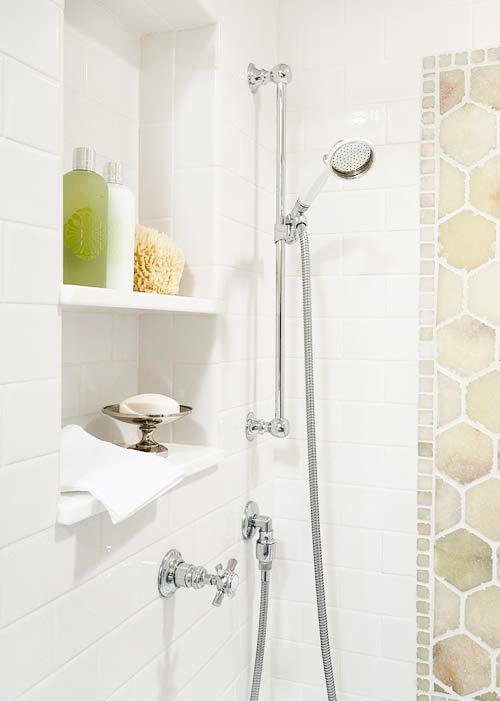 It’s inexpensive and creates extra space for each member of the family and even makes the bathroom feel more spacious. While you’re organizing, keep in mind that you want to save towels that are clean and are in good condition. Kondo suggests washing sheets, pillowcases, and towels frequently to keep them feeling soft and crisp every time. This is very important since it leads to happy thoughts and a peaceful mind, not to mention warmth and coziness. Your bathtub or shower should be a place to relax and unwind. Detoxing is very important and necessary for your body and mind. Kondo has a strict philosophy of not keeping extra items in the bathtub or shower; instead, keep only the ones you use regularly. Ask yourself how many bottles of shampoo and conditioner you’re actually using and which ones you use once-a-week. This will eliminate unwanted clutter and even help you to discard the eight expired bottles you may have laying around. Kondo guarantees that once you commit to her method of discarding unwanted items, you’ll never have to think twice about doing it, again. To organize the bathroom, Kondo’s famous method is to “tidy by category, not by location”. This method is effective for facial and hair products. Separate your makeup, hairbrushes, skincare products, and accessories into their designated storage bins or basket. This is a great way to keep similar items together and easy for a grab-and-go tray. This method is not only a space saver but can also make the space look more personalized. 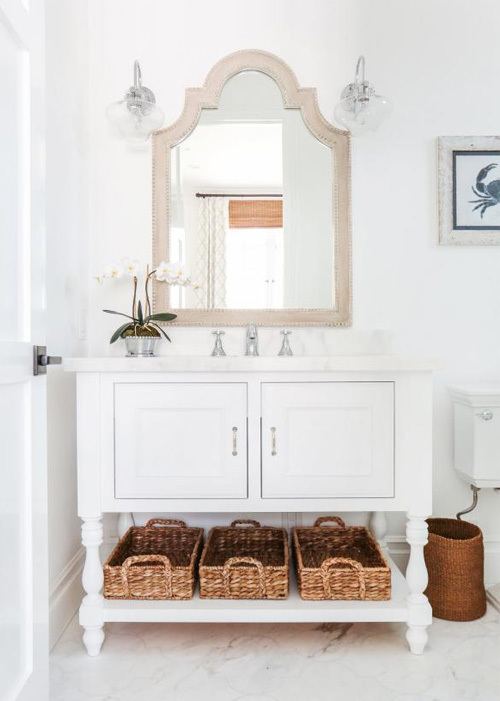 Try using baskets with designs or creative prints to display in your bathroom. Marie Kondo is truly an inspiration for any home. Which one of these tips sparked joy for you?